It’s that time of year! I’m not a fan of how commercial Valentine’s Day feels, but I also can’t really hate on any holiday that celebrates love. Growing up my dad would get my sister and I each a small, heart-shaped box of truffles from our favorite local chocolate shop, Lilac (it’s still in business, thanks goodness, and even has a location in Grand Central). My mom got the large box. All of us would savor the candies, sometimes taking only half a bite and returning the other half of the box for later. We showed a remarkable amount of self-control for children, but really we just had the foresight to spread out the enjoyment over a period of one or two weeks. Instead of making something new for this week’s vday-themed blog hop, I’ve dug into my archives to find some of my favorite romantic recipes. 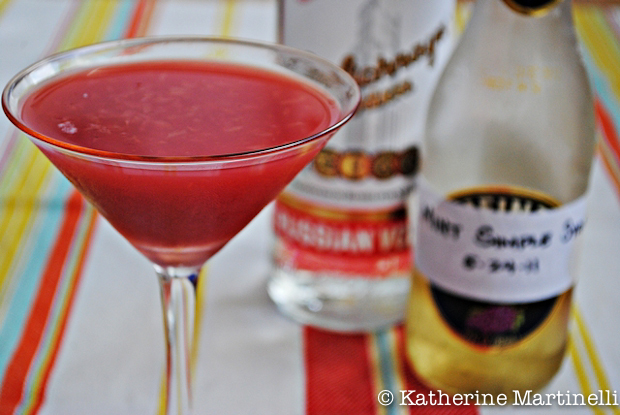 To start the evening, sip on a bright red, tropical cocktail and pretend you’re on a secluded beach somewhere. I’d recommend the fresh and fruity B7 Cocktail with vodka or gin, pomegranate and grapefruit juices, and mint simple syrup. Of course you’ll need a nibble to go with that, and what’s more romantic than fondue? I have a simplified version that requires no special equipment or skewers. 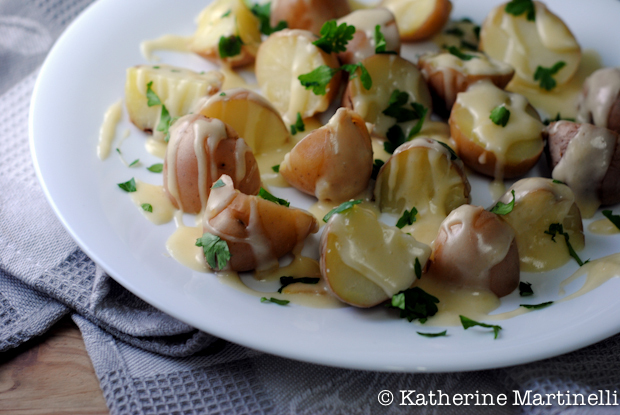 My Raclette Fondue is a fusion of two great Swiss melted cheese dishes, and includes a white wine-infused cheese sauce drizzled over potatoes. For a main course, how about a deceptively easy Tagliatelle with Shrimp and Champagne Butter Sauce? Yeah, I thought so. Whether you’re up for making your own pasta or not, this elegant and fancy-feeling dish screams romance. Serve it, of course, with a flute of bubbly. Or, if you want to stick with a red theme, make just about anything with beets! 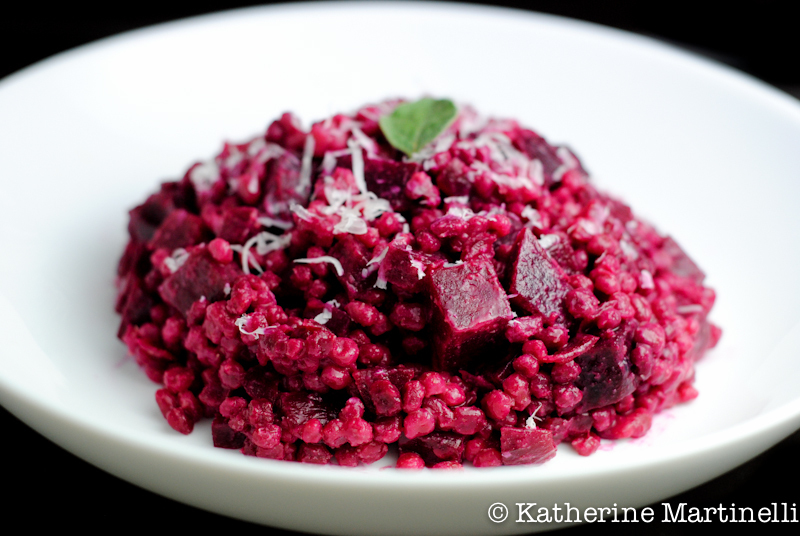 I’m of course a fan of my Red Beet and Barley Risotto, which is slightly healthier than traditional risotto made with arborio rice and is vibrant red in color. Then of course there’s the finale. 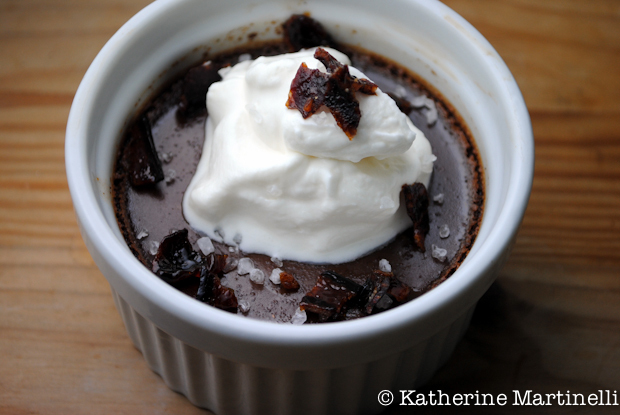 Top off the meal with a decadent chocolate dessert, like this silky-smooth, salty-sweet Spiced Chocolate Pots de Creme with Candied Bacon and Maple Cream. (Vegetarians of course can omit the bacon.) Each element of this easy but elegant dessert adds a layer of flavor, from the sultry dark chocolate to the warm spices, and from the slightly sweet maple whipped cream to the smoky bacon. 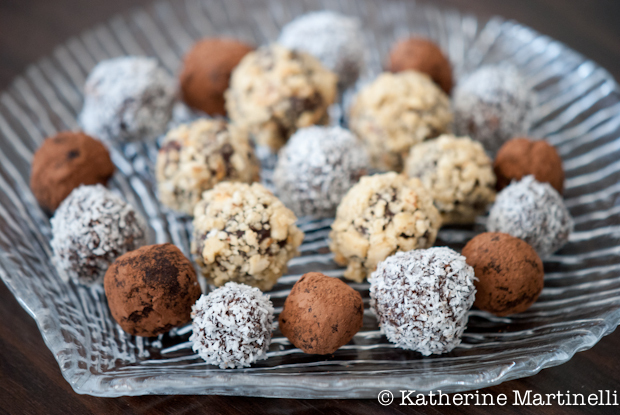 Or, if truffles are more your thing then make your own with my crazy easy Chocolate Ganache Truffles recipe. I just made these again yesterday and was blown away, once again, by how easy and delicious they are. The best part is deciding what to roll them in! This time I opted for cocoa powder, coconut, and chopped hazelnuts but anything goes. You can also customize them by adding a little flavoring to the ganache before it sets – try a drop of rose water or a few dashes of Kahlua for an extra special treat. For even more Valentine’s Day inspiration, check out last year’s Valentine’s Day Blog Hop (including my recipe for chocolate-covered strawberries!). And now it’s your turn to add your favorite romantic recipes to the menu! If the blog hop doesn’t show up below, click here to view the collection and add your links. I’m not a fan of the commercialization of any holiday, but Valentine’s Day is kinda over-the-top. Still, like you, how can you complain about a day that all of us devote to our sweeties? Very nice links – thanks. Thanks for hosting, Katherine! Happy Valentine’s Day! Seems every holiday is over commercialized…so I just make sure to handcraft goodies for my loved ones; for me it’s the personal touch that makes it special…to either give or receive! I’ve slowly been getting back into the swing of things this month and am happy to be part of your Friday blog hop again. I brought one of my favorite recipes that is tried-and-true yummy. Thank you again for the invitation to participate. Happy Valentine’s Day! PS: Katherine, I forgot to mention that I love all of your recipes that you’ve also shared and highlighted too! How would one choose just one of them? YUM! I have the same sentiment about Valentine’s Day – hate the commercialism but love love ;D Great wrap up list, and I hope every day for you is filled with love! What a fabulous round-up of Valentine Day goodies! Headed to check out some of the ones that have linked up. Happy Valentine Days! Hope you have a special one! I saw your link on MJ’s blog and so glad I did. All of your recipe’s look and sound perfect for V-Day or any special occasion. 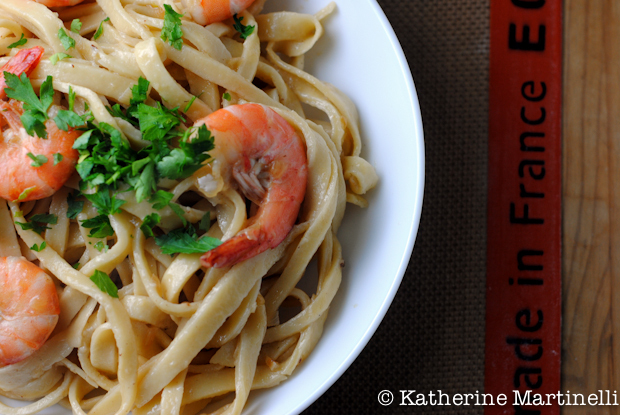 Your Tagliatelle with Shrimp looks particularly tasty! That is so sweet of your father to have included you in the gift giving:) Thanks for sharing and I’ll be linking up one of my recipes. I could go for any one of your savory dishes! But there’s just something about shrimp and champagne butter sauce that says Special Dinner to me. What a great round-up! What a roundup – looks delicious and just gorgeous! Love your Valentine’s day story from your childhood. That was lovely. Fabulous site, I look forward to looking through the rest of your site.